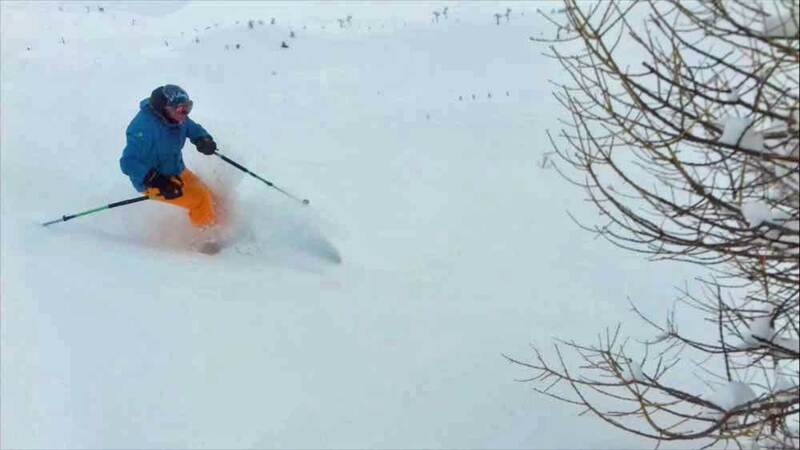 Where to find the best powder at this time of year? Sidecountry? Slackcountry off the back? Ski touring in north facing trees. Or at a deserted ski resort with virgin off piste?.. Where to go to find those powder stashes? Maybe it was worth doing one of our favourite slackcountry lift-assisted runs and practise with the drone? So we took the lifts up and skied to the top of the Col du Mea. The snow looked amazing. Pristine. A few turns later and it was evident that the snow was anything but amazing. Leg -breaking crust. I skied down a dozen or so turns so Gav could get the drone to follow me. All I can say is thank goodness he pressed a wrong button because it wasn't the best skiing style! After maybe 20 turns we put skins on and climbed back up. Snowing! Around 10cms by lunchtime so we headed up the hill to investigate. It was low vis but we could see the tracks were mostly filled in as we pinged off the Crete drag to do the old lift line then up the Barre drag for Pikey's shoulder (off to the right at the top) and up the Crete again to do the right hand side down through the trees. The snow was amazingly light. Like Japow. But it was so light that even with 15cms our skis were touching the base so you could hear / feel them on the icy crud. Still this is being slightly fussy. We had a couple of hours skiing super light powder. How bad? Gav, Ken and a couple of Vikings (Norwegian friends) did the ski tour near the Lauzet in the Ecrin (so Rando Chiens not allowed). It involved a bit of stealth skiing as a group of around 12 set out before them so they only climbed for 400m to get first tracks and then did a second climb to get some more. Not quite touring etiquette, but when they saw them skiing back down all over the place they didn't feel to guilty. The snow was good cold powder as it was north facing slope with trees. What to do? Lauzet trees again maybe as the snow was so good? 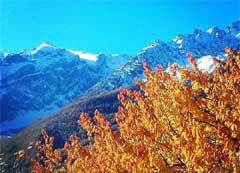 Or perhaps Abries in the Queyras where, according to Snow Forecast, at least 30cms had fallen over the past two days? We opted for the road trip with the Vikings. Driving towards Abries we were expecting to see snow-laden trees but it looked more like 30mm rather than 30cms! How could the forecast be so wrong? 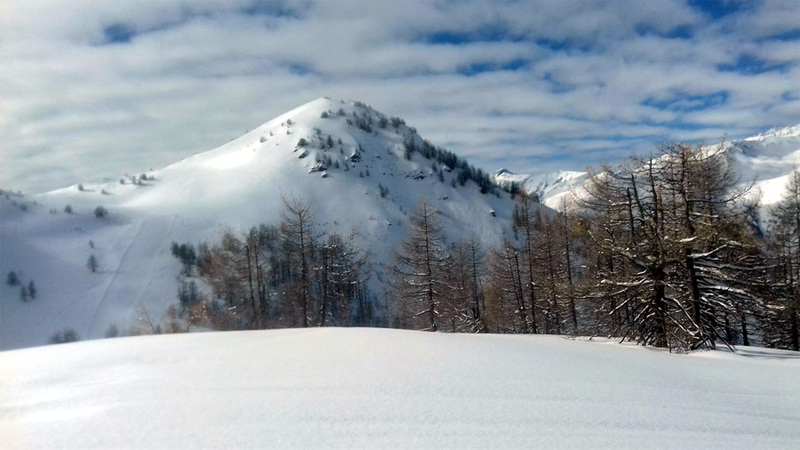 But we headed up anyway and, by the time we got to the top drag with virgin snow either side, it became apparent that they'd had maybe 15cms over two days and absolutely nobody had skied it. It was like having our own private resort. Even though it was 10.00 by the time we did our first run we were doing first tracks back down to the drag again. Then up and over to do the classic north facing trees - which we all agreed are so well spaced we could have been in Japan (main image). The tree run goes all the way down to the bus pick up. Although there's a red run for piste skiers, hence the bus, this is a brilliant service for freeriders as there is so much scope for off piste down to the road. 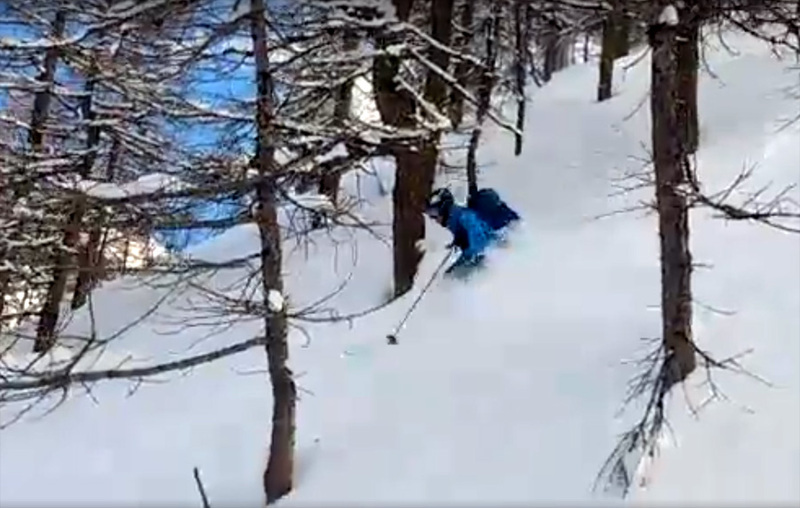 I did two long tree runs including a bit of a skin to get an even higher and better untracked line (image above) then drove the van around to pick the others up for a last run finishing at 16.00. I think during the whole day we did maybe 50m on the piste just at the bottom to pick up the drag!